Abel Jackson loves to dive. He's a natural in the water. He can't remember a time when he couldn't use a mask and snorkel to glide down into the clear deep. Life is tough out at Longboat Bay. Every day the boy helps his mother earn their living from the sea and the land. It's hard work, but Abel has the bush and the sky and the bay to himself. Until the day he meets Blueback, the fish that changes his life. Blueback is about people learning from nature. 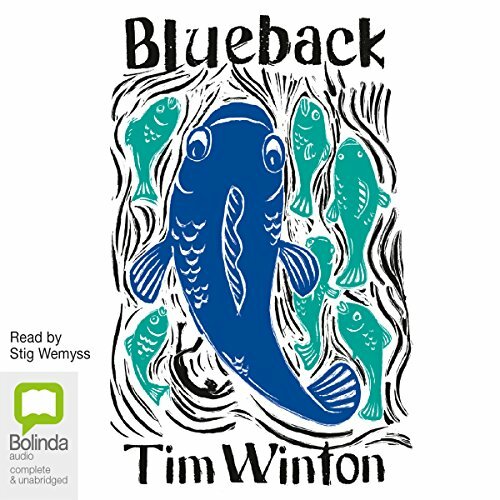 This was the first book of Tim Winton's I've read. I've heard so much about his writing. I wasn't disappointed. It was a short story about the sea, beautifully described, and a family who were part of its beauty. This is a beautifully poignant book much enjoyed by our whole family. The perfect audio book for our road trip up the north coast of nsw. Love Tim Winton and all that he writes- a true master of words. I remember my mother reading this to me as a young boy. amazing to visit this classic from my youth.